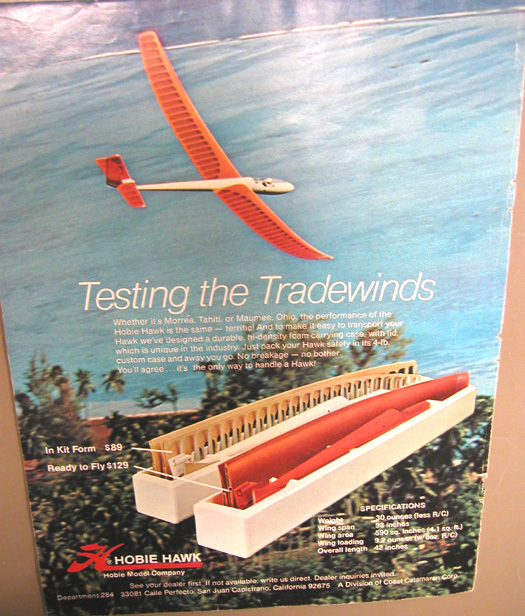 March 1974 the Hobie Hawk was released by the Hobie Model Co. of San Juan Capistrano California. Designed by Hobart "Hobie" Alter of Hobie surf board and sailboat manufacturing fame. Click HERE and HERE for more interesting info on Hobart "Hobie" Alter the creator of the Hobie Hawk and other Hobie products. 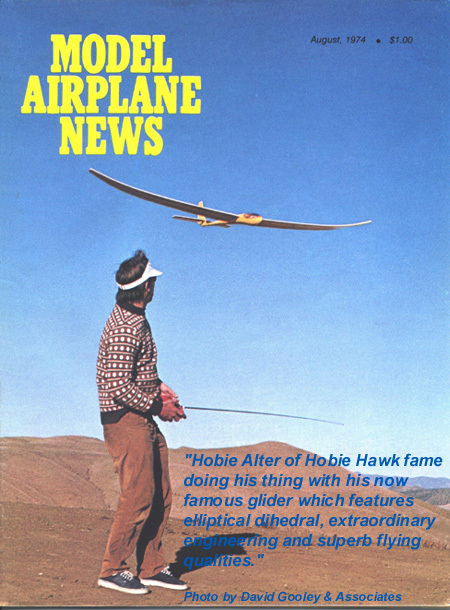 Check out this cover of Model Airplane News - Hobie Alter doing his thing! The Hobie Model Co. sold somewhere between 10,000 and 14,000 of these birds! These are the best estimates I have. 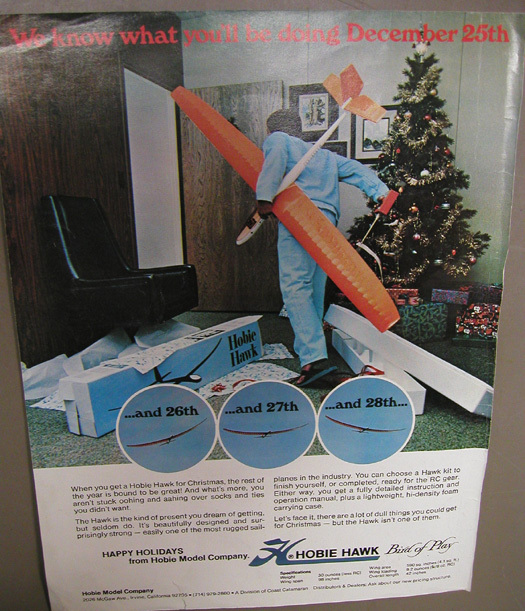 Many of the early Hawks were sold through the Hobie Cat sailboat dealers not just hobby shops. This is probably part of where the Hobie Hawk "reputation" got started... many first time r/c flyers were buying these cool looking birds, not really knowing what they were purchasing - a high performance sailplane not a beginners trainer! Q: How long before the production of the Hawk were you interested in r/c gliders? Hobie: "Since around 1954, I flew when the transmitters had buttons, not levers! You pushed a button once to turn left and twice for right etc., so I've been around r/c flying for a long time." Q: How did the design of the Hawk come about and how long did you spend developing it? Hobie: "Well, I tinkered around with the design on my own (apart from the Hobie Cat Co.) for about a year at my home. I finally convinced Hobie Cat Co. that we should build this plane. We spent around 6 more months working on the design. It was expensive to tool up - one of the smallest parts, the dorsal which is injection molded, cost $12,000 for the mold alone - that was a lot of money back then and that was just one small part. We had jigs for everything, it cost a lot to get set up to build this plane"
Q:Why did you make the plane in the way you did? (An infihedral, undercambered, tapered, foam core wing laminated with hardwood ply, then there is that fuselage with it's 3 piece construction: Polyethylene roto molded nose cone, 7 layer fiberglass mid-section and ABS plastic dorsal assembly). It's a pretty complicated plane, especially for 1974!? Hobie: "I did it the way I wanted too - each part used the best materials available for the specific application. It was a complete package and we had the capability to make the Hawk so we did. There was nothing else out there like it at the time, everything else was a balsa build up kit, I wanted to produce something much different, something that could take a the punishment and was faster to build for the consumer... and yes, although the wing was complicated it was not difficult for us because of our background in the sailing and surfboard industry, foam core laminating was what we did." Q: A friend sent me an early pre-production photograph of a Hawk - it had dihedral starting immediately a the fuselage, not like the final version, How many prototypes were there? Hobie: We had many prototypes - 6,8,10 and 12 foot wingspans, one set of wings was only 3" wide but the ones that flew best were the 8 footers and if you built a set of lightweight ones it flew even better". Q: I saw ads for the 6 foot wings, but I have never actually seen a pair, what happened? Hobie: They just never made it into production, although the 10 footers did but I still liked the 8 footers the best." Q: What was one of the strangest things you did with a Hawk? Hobie: "Well, I built up one that looks kind of like a P-38 with a twin boom fuselage joined at the tail with a center pod cockpit if you can imagine that. I actually still have it and it's hanging right here in my home at the moment." Q: What is you favorite Hawk color? Hobie: "I really like the transparent colors, the blue I think. A really neat thing I like is to spray the wing with a black tint before covering it with a transparent film, it really shows off the wing that way." Q: If you could sum up your experience with the Hawk what would you say about it? Hobie: "I feel that out of all my projects the Hawk was one of the better things I did, each part made from the proper materials, it was a quality product and I am proud of it... and it was fun!" 1976 or 1977 - Shortly after Coast Catamaran purchased Hobie Alters Hobie Cat Company the Hobie Hawk and tooling was sold to Midwest Products Co. of Hobart, Indiana. It continued to be produced as the "Midwest" Hawk until 1979. February 1979 - the tooling was purchased by Bob Martin RC Models and they produced approximately 4,500 Hawks between June 1980 and July 1986. 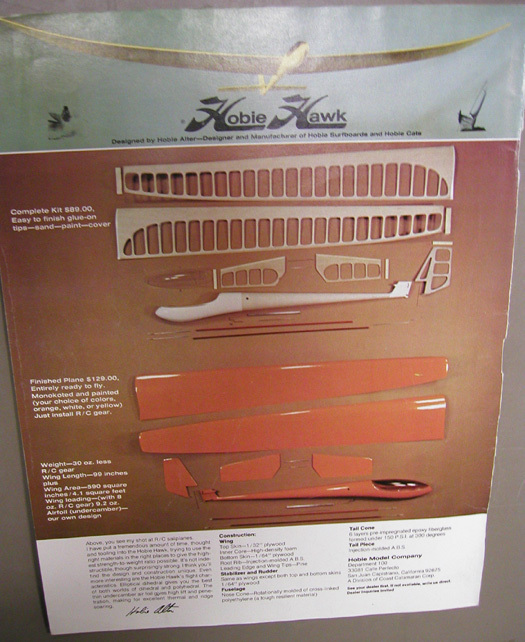 1990 - Dennis Ross of Ross Model Co. Sparks, Nevada purchased the Hobie Hawk tooling from Bob Martin. Dennis Ross made limited production runs of the Hawk with the last full production run in 1994 - that year being the 20 year anniversary of the Hobie Hawk. After seeing first hand at the shop of Ross Model Co. the incredible difficulty in producing the Hawk I can easily appreciate why the manufacturing has been so limited and/or sporadic. There are many places where mistakes can be made and parts damaged beyond "saleability". The wings alone are a work of art. Not one straight line on the entire panel! There are certainly easier state of the art manufacturing techniques today, but if they were implemented to build a Hawk would it then be a Hobie Hawk? 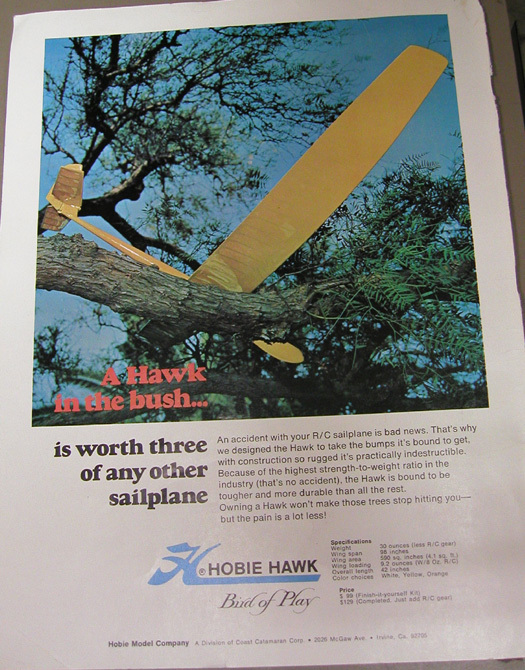 Not only was the Hawk an extremely difficult plane to manufacture but it was also many, MANY years ahead of it's time, as was most of Hobie Alters products. I can remember as a boy of 14 years of age when I first glimpsed a Hobie Hawk hanging on the ceiling of the local hobby shop. How intrigued I was by the fluid curving lines of that cool looking Hobie Hawk! Those feelings are more present than ever today! I enjoy just LOOKING at a Hawk! Those curved wings spread out... just like a soaring hawk!! It seems over the years there have been many complaints about the Hawk being difficult to fly and if not set up properly this is certainly true. Check out the set-up page to get your Hawk flying properly When the Hawk is set up properly it will fly as good as if not better than many of the hi-tech planes of today... keeping in mind that this is a rudder/stabilizer set up. See how a Hobie Hawk is made!